TG1297AP – Off-plan apartments for sale Ciovo are placed in a small apartment building on the south side of Ciovo, in a beautiful bay with a great beach and crystal-clear seas. The apartments will share a pool and amazing sea views. There are two apartments for sale Ciovo and they are placed in a three-level building with six apartments altogether. All apartments comprise two bedrooms, one bathroom and a spacious and open-plan living area. Both apartments that are left for sale are placed on the top floor of the building. The apartments are 54m2 interior size each. One is 160.000€ and the other one is 170.000€; this price also includes a 9m2 terrace and a superb roof terrace of approximately 55m2. Each apartment comes with its own parking space included in the price, which is a very good advantage. The building is situated in a beautiful and tranquil zone, surrounded by beautiful Mediterranean nature, close to the azure blue sea. The living areas and terraces are oriented towards south, so you can enjoy a lot of natural light and wonderful sea views during the day. 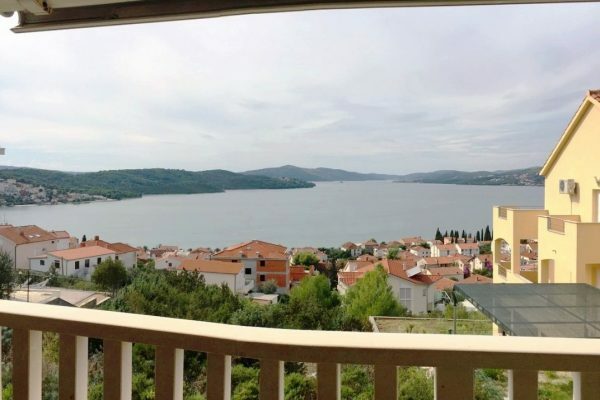 Here you have several shops and restaurants nearby, and just a few kilometers away you have the wonderful city of Trogir where you can find everything you need in terms of amenities, and you can also enjoy sightseeing and walking around the beautiful, UNESCO-protected old part of the city. The international airport is also nearby, and the wonderful city of Split with its excellent amenities (including the biggest ferry port in Croatia) is at a distance of approximately 30km.